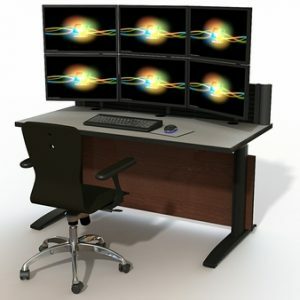 A sit/stand console solution intended for the emergency response & NOC control room environments. Command Flex Adjustable feature adjustable height work surfaces for keyboards and/or monitors to help operators customize their work space for their optimum ergonomics. These are often used in environments which require operators to constantly man their workstations such as dispatch and emergency response. These are often government facilities which need to maximize their budget. Command Flex provides the ergonomic and functional benefits of a professional adjustable height control room workstation while keeping costs to a minimum.